Our main story this time is of course the follow-up to the quiz in the previous issue. I got some great responses in the mail ... not a whole lot of right answers ... but certainly a lot of interesting answers ... Thanks to those of you who participated, and you can find out how well you did by checking the real answers in this issue. The last few months of that first year of the project saw good progress on all aspects of the work. Although I was spending about 30 hours per week on English teaching activities, I was still able to keep up the pace of one print per month, spending about three weeks on the carving, and then a couple of days on the printing (as only a very few collectors had yet joined, I was only making a couple of dozen copies of each print). When I first moved to Hamura there had been a small wood-block printmaking 'circle' at a local community centre, but it had faded away. When the 'Bunkasai' (culture festival) came around in November that year, there were no printmaking activities planned, so I volunteered to do a workshop where kids could learn something about it. I carved some simple blocks, prepared a pile of brushes, pigments and paper, and set up some tables where kids could try printing their own prints. This 'hanga corner' was a great success, and they lined up by the dozens to try it. It has become a traditional part of the Hamura Bunkasai, and the kids gather round eagerly every year to see what design I have brought this time. (Of course I don't use 1000 year old designs. The biggest hit so far has been characters from the big hit movie for kids - 'Tonari no Totoro'). I spent the last day of that year sitting peacefully carving in my workshop, and as the sound of the New Year temple bells floated across town late that night, I was still at it, going round and round the patterns on Sarumaru Dayu's kimono. It had been a very, very good year. On the one hand I was losing money, spending more on the printmaking than I was getting back, and barely had enough left to survive. I was also too busy, and barely had enough time each month to get everything done. But I was well and truly launched on my adventure, and there was no thought of turning back. I knew where I was ultimately going, but where the voyage would lead me along the way remained to be seen. What would the new year bring? The moment you've all been waiting for ... haven't you? It seems that perhaps I made the quiz in the last issue somewhat too difficult, as most of you gave up without sending in any answers. There were a few though, who got quite a number of questions correct ... they should - they are printmakers! In any case, here are the answers - 10 'one-point' lessons in traditional printmaking. 1) Those pigments that do not dissolve readily in water are first soaked in alcohol. Most of the traditional printers thus keep a bottle of sake by the side of their workbench (purely for professional use, of course). Actually, as I don't like the idea of all that sugar staying in the print, and perhaps providing food for bugs of whatever kind, I use pure alcohol from the pharmacist. I didn't even have any sake in the house when the quiz program TV crew came over that day, and Michiyo had to run out and buy a bottle. She made a good choice though, because when the president of the company who made it saw me display it on TV, he sent us a complimentary supply of the stuff! 2) The night before starting work on the printing process, Japanese printers thoroughly moisten their printing paper. A lot of Western printmaking is done on dry paper, with oily pigments, and the resulting image is formed only on the surface of the sheet. The paper simply acts as a carrier and support for the pigments. The colour in Japanese work, however, is actually driven deep into the body of the paper by the baren, sometimes even coming out onto the back side. This is only possible if the paper has been moistened first. Attempting to print on dry paper just gives a speckled, uneven surface. The second reason has to do with paper expansion. If one were to try and make a multi-coloured print on dry paper, the paper would absorb moisture from the first colour, and in doing so would expand slightly. The second colour would then no longer 'fit' in the proper place. If however, the paper is wet (and expanded) to start with, then there is very little further expansion during the subsequent printings. After all colours are done, the paper is carefully dried, and shrinks back to natural size. The finished print thus always ends up slightly smaller than the blocks from which it was printed! 4) Three uses for bamboo skins: 1) Of course, the outer wrapping of the baren itself is a whole skin, stretched and tied in place. 2) The inner 'coil' hidden inside the baren is also made of bamboo skin (we'll be investigating this more closely in an upcoming issue of his newsletter ...). 3) Left-over bits of bamboo skin are used to make the 'tokibo', the small brush used to transfer the pigment from the bowl to the block. 5) Why don't I use 'seki-o'? Well, would you use a pigment made of 50% sulphur, and 50% arsenic? Would you bend over your bench and grind it in a mortar until it became nice, fine powder, floating around the room? And even if you would, what would your spouse say about it? 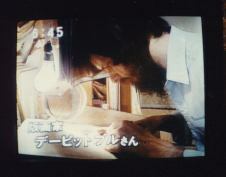 6) I learned about shamisen string when I did a television appearance visiting the carver Ito Susumu. He inspected my tools, and was surprised to find that I was using masking tape to hold my knife blade in position in the handle. I hadn't really thought that this was a problem, but when I followed his recommendation and used shamisen string to tie the blade tightly in place, I found it much easier to guide the knife. 7) Which comes first, the outline or the colours? This one puzzled me too when I was working on my own back in Canada. It's nice to do the black first, so you can then guide the colours into the correct location, but don't the colours cover up the black lines? Actually, they don't at all. Although the colours may look solid and deep when printed onto white paper, they are actually quite transparent, and the strong black lines show clearly through. 9) I am told that the carving knife modern printmakers use is actually descended from a type of short blade worn by samurai many years ago. 'Katana' is the name for their sword, and the shorter blade was known as 'ko-gatana', or 'small sword'. This is the term that the older carvers still use for our knife, which doesn't look much like a sword, but which is actually made with a similar laminated technology, with a soft, flexible steel acting as support for a hard brittle steel sharpened to a keen edge. If the skin isn't stretched tightly enough, the resulting baren is unuseable. 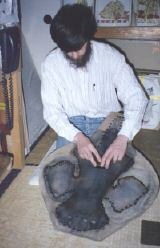 The water-softened skin is first rubbed with the hands on a hard board to stretch it. After it has expanded adequately, it is rubbed on the same board with a hard object, to further soften some of the fibers, and break down some of the protruding ridges. 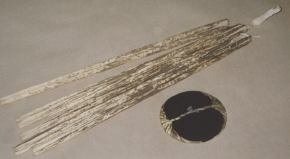 It is then trimmed and tied around the baren disc. (Ten short words to describe that process, and ten long years to learn it!). Of course, the stone in the quiz is the hard object I use to rub the skin, just like printers many years ago. I chose it very carefully, as one too small would not supply enough force, and one too big would damage the skin. And Matsuzaki-san - why is he laughing? Well, he doesn't care as much about traditions as he does about efficiency .... he uses the back end of a pair of Japanese wrought iron scissors. Oh, these modern ways ....! At Narita I didn't know what to say to the Immigration people. I knew that I could get a three month tourist visa, which could probably be renewed for another three months, but with a tourist visa I wouldn't be able to work and support my family. I hoped that maybe I could get some kind of a student visa, which would allow a certain number of hours of work each week. The Immigration man looked at Michiyo and the kids. "Is this your family? Your wife? Is she Japanese?" he asked. "Yes ... yes ... yes," I answered. "Well, why don't you get a 'spouse' visa? With that, you can live where you want, study whatever you want, and work at whatever you want - no restrictions." I was flabbergasted. I had never heard of such a thing. The people back at the Japanese consulate in Vancouver had put me through a six-month-long application/waiting/refusal procedure for a cultural visa, but had never even mentioned this. This was the answer to all my prayers. I entered Japan that day under a tourist visa, and a couple of months later, after a bunch of paperwork to prove to them that yes, we were indeed a 'real' family unit, I had my spouse visa - valid for a six month term. In due course, they renewed this - first for another six months, then for a year, then for another year, and then for a three year period. There have never been any problems with the renewals, and the Immigration procedures have been simple, quick, and friendly. But I have always felt a kind of sword hanging over my head each time I go ... what if they say 'no' this time? What would happen to my work, my family, my whole life ...? When my three-year term expired last fall, and I went to Immigration to seek a further term, I received the extension, but also put in a different kind of request. 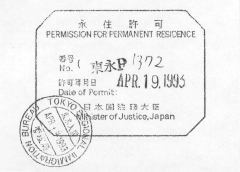 It required many pages of paperwork: a comprehensive personal history, 'koseki' and marriage documentation, residence certificates, tax information for many years back (national, prefectural, city), employment information, and guarantor's statements (including his employment, tax and family information). 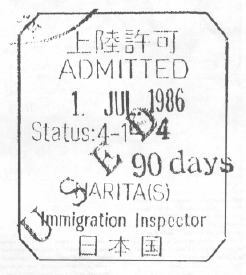 This April, after a seven-month wait, my request was granted, and I visited the Otemachi Immigration office and received the 'eiju' stamp in my passport - I am now a Permanent Resident of Japan. Does it feel different? Well, yes ... and no. Of course I am very pleased to have it, and feel much more secure, knowing that I do not have to go and ask for permission to continue my 'life' every few years. It is also pleasing to have the official recognition that I am doing something useful and of value to this society. But in one way it doesn't feel very different at all. Almost right from the first day I set foot in Japan, I have felt at home here. And this is a great puzzle to me. When you think about it, I should be quite uncomfortable in this country. There is still a huge language barrier - my 'nihongo' is getting slowly better, but I can only communicate a tiny percentage of what I really want to say. In Canada I was completely fluent. Here I have become illiterate - I wander through the wonderful bookstores almost crying in frustration at being so 'retarded'. In Canada, I lived in bookstores. Here my living environment is really quite cramped and uncomfortable - I even have to clean up my wood chips every night just to make a narrow space to lay down to sleep. In Canada, of course I could enjoy a wide, wide living space. Many of the people I knew back in Canada would have run away screaming by now, if they had to live the way I do ... So why do I feel so much at home here? Well of course, a good part of it is my community - Hamura. I am familiar with many different societies around the world, but cannot think of anywhere where the trade-off between individual rights and social responsibilities is balanced so well as here. JFK's famous dictum about "Ask not what your country can do for you ...." is really and truly observed here, and I am pleased to be in a position where I also am able to make a real contribution to the functioning of the community. Another reason is my daughters. They are totally 100% integrated here, enjoying their school life and dozens of friends and activities. I am hard pressed to think of anywhere in the world where they could find a better environment in which to grow up. And although I sometimes grumble about the amount of time I have to spend on school meetings, and PTA, and dodgeball tournaments, and piano classes, etc. I know that my participation is also an important part of the process, and I don't begrudge it. But of course, the most fundamental reason is my work. Every day I sit for long hours on Japanese tatami mats, and using traditional Japanese tools, carve on Japanese wood, creating Japanese designs (based on centuries-old Japanese poetry), which I then print on traditional Japanese paper, in Japanese colours, using Japanese pigments. Good grief - how can I not feel at home here? How on earth could I ever work anywhere else? Am I becoming Japanese? Well, I don't know about that. I was born in England, but I left when I was five years old, and certainly don't feel English. I grew up in Canada, but am gradually becoming more and more unfamiliar with Canadian society, and somehow no longer feel much connection with Canada. I don't really know what nationality I am any more. But about one thing, there is no doubt. I am quite often asked, "Where is your home?" For a number of years now, my answer has always been the same, and now with this new stamp in my passport, it is official. My home ... is Japan. After a few more issues, the '... genesis of this project ...' column will be coming to a natural end, and it will become an occasional '... update on this project ...'. I've started to cast around for something to replace it, and I wonder if any of you have any suggestions on this. I've actually got plenty of ideas, but it's very difficult for me to know what you are interested in. What kind of things would you like to read about in this newsletter? If you give me some feedback, I'll be able to put together something that you can enjoy reading. If you don't, then who knows what I'll come up with ... Beware!